It’s almost Halloween and these Hairy Spider Cookies are such a Fun way to Celebrate! 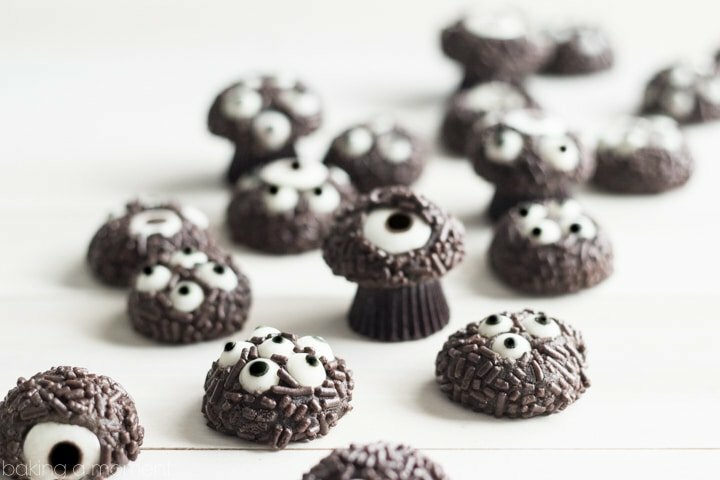 A Fudgy Dark Chocolate Cookie is rolled in Chocolate Sprinkles and Covered in Spooky Candy Eyeballs. So Cute for Kids, and Easy to Make! How was your week? Can you believe that it’s almost Halloween already? Once again, it’s totally snuck up on me. I wish I was one of those with the gorgeous seasonal decorations, the lanterns and painted pumpkins and beautifully styled mantel but sadly we do not have a stitch of holiday decor up and my kids don’t even have costumes yet. Everything is always a mad rush around here. But the one thing I do manage to keep on top of is baking! I don’t know about you but at my house we just can’t deal with the really gross, horrifying Halloween stuff. My boys are only 7 and 5 and the little one especially seems to be scared of everything. So cute and spooky is about all we can handle around here. I made these spooky hairy spider cookies for Christine’s Halloween event over on I Dig Pinterest a couple weeks back, and now I’m so excited to be able to share them with you! But before I talk about that I wanted to ask- do you guys know about Aldi stores? I only recently visited one for the first time, but I think it’s really going to change the way I shop for food. You can save so much money! 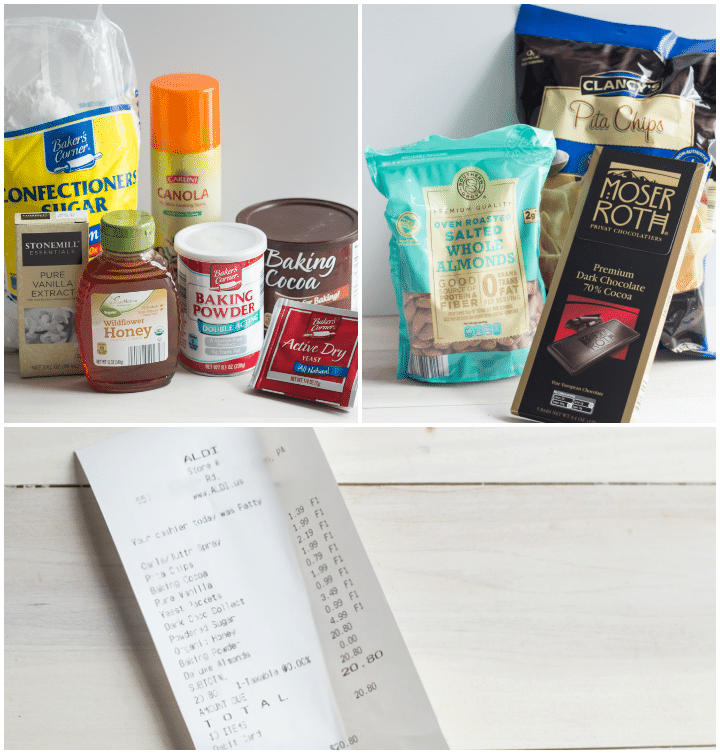 As you can imagine, as a food blogger I find myself at the grocery store several times a week and baking staples like sugar, extracts, cocoa, and stuff like that can add up to quite a lot when you’re needing to buy them so frequently. At Aldi I can pick up those basics for a whole lot less. Aldi stores carry mostly their own private label but the quality is really great. And there’s more than just baking stuff there- they have all kinds of foods including fresh, organic produce, snacks, meats and cheeses, and bread. There are just a few things you need to know before you take a swing by: 1) bring your own bags (which you’re probably doing anyway, it’s just better for the environment), 2) they don’t have an employee working the parking lot corralling shopping carts, so you just drop a quarter into the cart thingy and then it refunds you when you put it back, and 3) they only take cash or debit, no credit cards. All these little things add up to a savings that makes it all more than worthwhile. As you can see from that pic up there, I got everything for 20 bucks and change. At my regular market I would have paid close to that just for the almonds, chocolate, and pita chips alone. Now let’s talk about these cookies! They are so fun and easy! My kiddos got in on the creating and we had a blast together. 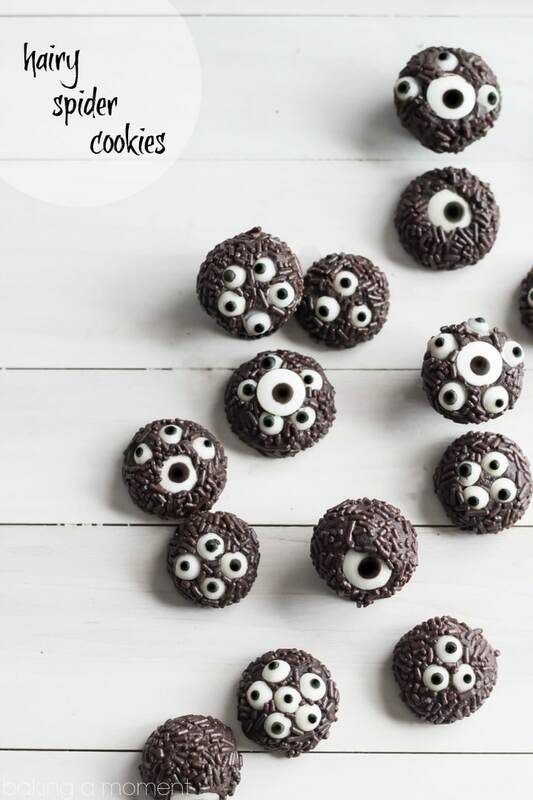 I threw the cookie dough together in the blink of an eye (no pun intended), and then we rolled the balls in chocolate sprinkles and pressed in some candy eyeballs. Just go nuts! There’s no wrong way to do this! You could even add some black licorice whip legs if you want, but I had trouble finding them so I just sat a few of my critters on an upside-down peanut butter cup. I kinda think it looks like lots of creepy bug legs. It's almost Halloween and these Hairy Spider Cookies are such a Fun way to Celebrate! 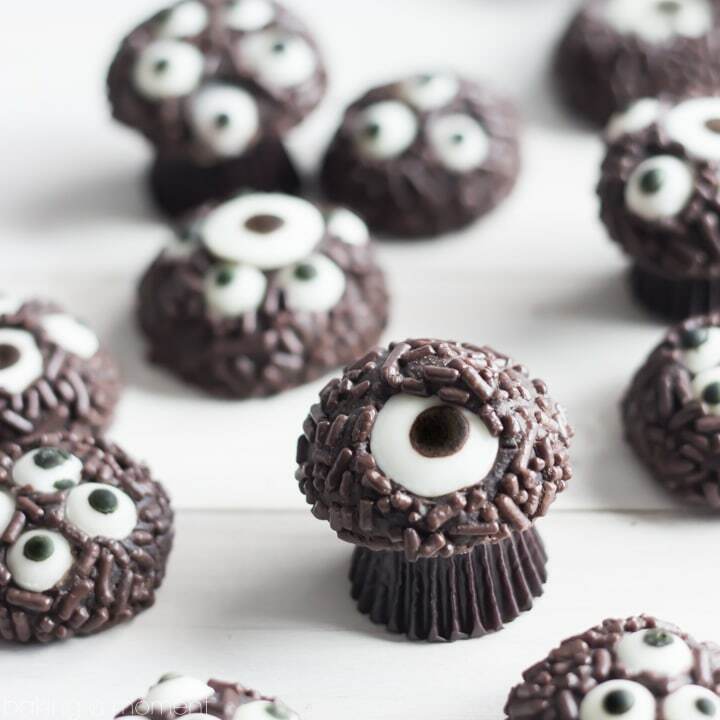 A Fudgy Dark Chocolate Cookie is rolled in Chocolate Sprinkles and Covered in Spooky Candy Eyeballs. So Cute for Kids, and Easy to Make! Beat the butter and sugar together in a large mixing bowl, until fluffy. Add the egg and vanilla and mix until well-combined. Stir in the flour, cocoa powders, and salt, and roll the dough into balls, about 1 tablespoon. Coat the balls in chocolate sprinkles and press in the candy eyeballs. Refrigerate for 30 minutes minimum. Bake the cookies (on parchment-lined baking sheets) for 10 minutes; cool completely. Place on mini peanut butter cups. The best part about these cookies is how good they taste! They are soft and fudgy inside, and the flavor is almost exactly like an Oreo. My boys are veeeerrrrry picky about what they eat, even when it comes to sweets, and they were begging for more of these hairy spiders! They’ll definitely be making an appearance at their class Halloween parties. Thank you to Aldi Stores for sponsoring this post and making it possible for me to continue to bring quality content to my readers. All opinions expressed herein are straight from my heart. These hairy spider cookies are so cute, Allie! I think the cuter-rather-than-scarier Halloween treats are the best! We don’t have any Fall or Halloween decorations up in our house yet either. That’s my goal for this weekend! Good luck! I have to be honest I don’t think the decorations are ever going to happen here, lol. Real talk. Thanks so much for the sweet comment Kristine and I hope you enjoy your weekend! I have an Aldi’s near me! i go there sometimes 😛 These cookies are SOOOO cute and look like such a treat! Aren’t the prices insane? I couldn’t get over it. Thank you so much Kayle and happy Friday!! My family used to shop at Aldi’s when I was growing up (a looong time ago). You really can’t beat the prices. I’ve haven’t been in one since I was a kid though. If there’s one near our new house I will definitely have to start shopping for staples there. These cookies are adorable. I jsut can’t get over how cute they are. Pinning! Thank you Jen! Ya I didn’t realize that Aldi had been around for so long. The first store I went to was older, but there are some newer ones nearby that are huge and really nice! These are the cutest things ever! I love the Aldi shopping information! Oh my GAWD, these cookies are so frickin’ cute!!!! Almost too cute to eat. Almost. Lol thank you Just Putzing! I thought so too but they taste really good. Like, really. 😉 Thanks so much for stopping by and for the sweet comment! Thank you so much for pinning! And definitely check it out- it’s really great for families. You’ll save a ton! These are so ridiculously fun!! These are so cute and creative and saving money is always a good thing. You can make little minions by using yellow sprinkles with the one-eyed cookie..lol. I just thought of that while looking at the photo. Oh mY gosh these cookies are so cute!! I love getting my baking supplies at Aldi’s. Saves me a ton!! How creative Allie. I love how expressive and individual they all are. Thanks Katie! My kids had so much fun making each one unique 😉 So happy you enjoyed; thanks so much for reading and for the sweet comment! Thank you sweetie! I’m so happy you like them. I hope you and your little ones have lots of fun this holiday! Hugs to you all! Ahhhh … I was trying to figure out how you made the spider legs … genius, Allie! I love these little cuties. I wouldn’t be able to take anything scarier, either! Pfft I’ve been paying that all along! I didn’t even know about Aldi until recently and now I’m really kicking myself for paying through the nose all this time. I won’t make that mistake again! Thanks for the sweet comment Helen; hope you have a great week love! These cookies are so cool, Allie! I LOVE Halloween, especially all of the fun treats! Even though Halloween is not that big here in Australia, I definitely need to make these spider cookies! They look so cute and you obviously put a lot of effort into them… I almost wouldn’t want to eat them Allie! Honestly they were pretty simple to make! My kids did the eyes and they had a blast 😉 And they loved eating them too! So happy you enjoyed; thanks so much for the sweet comment! These are super cute!! I LOVE Aldi stores. I don’t know what my grocery budget would be like without it! 🙂 Pinned and sharing! Oh my gosh I had no idea about that stereotype! I don’t think it’s that way here in the US- I visited 3 different stores and they were all clean and bright and I had no trouble at all at the checkout! I hope it turns around in the UK because I think the products are really good quality and the prices can’t be beat! I absolutely adore these cookies and just want to gobble those hairy spiders right up! Ha! You are so clever, Alllie! Thank you Christine! You are too sweet, thanks for reading and for the kind words; hope you have a fun Halloween! You are so creative, Allie! I can’t get over how cute these cookies are! Perfect for Halloween! Allie, they are super fun and cute! Now those are truly my Halloween treats. We don’t have Aldi around here, but I’d love to visit one. These cookies are so cute and very creative! I like going to Aldi, too! Hooray! So glad you like Mira! Thanks for the great feedback sweetie! How darn cute are these! Absolutely adore them for Halloween – so fun. Pinned! Aw thank you Rachel! Hope you had a really fun weekend sweetie! Even if these spiders were to crawl all over me, I would gladly let them! They look delish Allie!!!!!!!! <3 And so perfect for Halloween !!! Those multiple eyes on the spiders are the cutest kind of spooky I have ever seen. Kind of reminds me of Monsters Inc. hehehe! Aaaaaah these hairy spider cookies are absolutely adorable, Allie! Just looking at your photos is putting a huge smile on my face. And don’t sweat the lack of Halloween decor. I certainly wouldn’t care when there were cute and delicious treats to eat! You need to talk to my kids. They were asking if we could decorate at like 7 this morning. Uh, hell to the no? Too late for that now, my dears. There’s always next year! Thanks for making me feel better about it hon!